At the Supreme Court this morning, an unusually large number of veteran advocates was on hand to watch oral arguments. But they were not there just to listen to the unusual discussion of how to compensate individuals for the thieving ways of the late dictator Ferdinand Marcos, at issue in the first argument, Republic of the Philippines v. Pimentel. Many were there to mark a milestone for Deputy Solicitor General Edwin Kneedler (pictured above.) He was arguing in the 100th case of his career in the solicitor general's office, more than any living lawyer currently in practice. Former deputy solicitor general Lawrence Wallace, who argued 157 cases before retiring in 2002, was in the audience, as were onetime colleagues Drew Days, David Frederick, Richard Lazarus and Andrew Pincus, all now in private practice. As the argument ended, Chief Justice John Roberts Jr. said the case was submitted, but the lawyers were not free to leave. He called Kneedler back to the lectern to congratulate him on his 100th case. Kneedler was the first lawyer to reach this milestone in the new century, said Roberts, also a onetime colleague of Kneedler's. "We look forward to hearing you many more times." The 62-year-old Kneedler, who seemed surprised at the rare gesture of recognition from the bench, thanked Roberts and said, "It has been a very great honor." 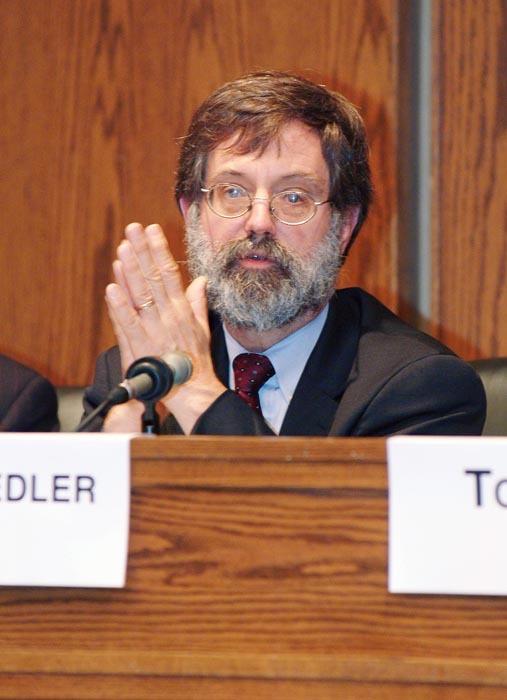 Lazarus, who now heads the Supreme Court Institute at Georgetown University Law Center, praised Kneedler afterwards for his skilled advocacy. "While always a zealous advocate for the executive branch," Lazarus said, "he never loses sight of the compelling need for complete integrity in the government's written and oral presentations before the Court."